LOOK who’s making a comeback in the Philippine Super Liga? It’s no less than three-time champion Philippine Army. After a three-conference absence, the Lady Troopers make their highly-awaited return as they are set to see action in the league’s Invitational Cup, which kicks off on February 18. Now carrying the name RC Cola, the team retains its solid veteran core of Tina Salak, Nene Bautista, Michelle Carolino, Jovelyn Gonzaga, and Royse Tubino, while also back in an Army uniform is volleyball darling Rachel Anne Daquis. Expected to crowd out the Lady Troopers for the title are retooled teams Foton, Cignal, and Petron while new comers F2 Logistics and New San Jose Builders, Inc are going to prove their mettle that they belong in the league. Grand Prix champion Foton, meanwhile, will miss prized middle blocker Jaja Santiago and setter Ivy Perez due to the ongoing UAAP women's volleyball tournament, although the Toplanders have tapped former University of Santo Tomas standouts Angeli Tabaquero, Rhea Dimaculangan, and Maika Ortiz. 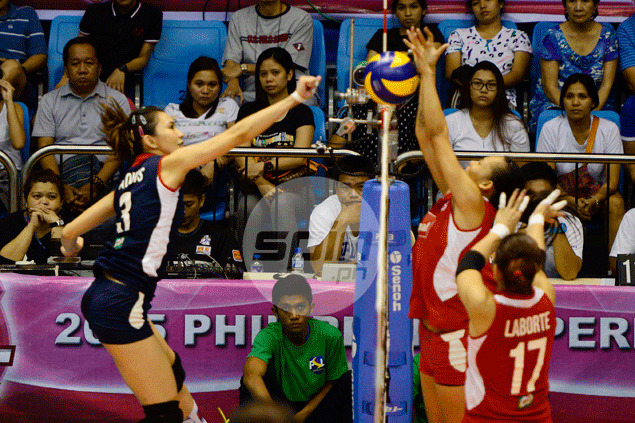 Former two-time champion Petron lost its triple-threat in Daquis, Dindin Santiago-Manabat, and Aby Maraño, but Aiza Maizo-Pontillas, Bang Pineda, and one-time NCAA Most Valuable Player CJ Rosario are expected to lead the Tri-Activ Spikers. Daquis has returned to Army, Santiago-Manabat will sit out the conference due to pregnancy, while Maraño has yet to hook up with any team. Cignal took recruitment seriously and went as far as the Visayas and Mindanao to sign former Holy Cross of Davao College ace Mary Jane Berte and Cebu-based Southwestern University hotshot Marlyn Llagoso, together with the core of NCAA champions College of Saint Benilde in Djanel Cheng, Jeanette Panaga, and Janine Navarro. But newcomers F2 Logistics and San Jose Builders are also loaded with stars. The Cargo Movers will be powered by the comely pair of Cha Cruz and Paneng Mercado, together with veterans Pau Soriano, Lilet Mabbayad, Chie Saet, and Danika Gendrauli, while the Victorias will be carried by University of Perpetual Help stalwarts Coleen Bravo and Lourdes Clemente. “This is going to be a very exciting tournament,” added Suzara, whose strong ties with the Thailand Volleyball Federation gave the league a chance to invite a top-tier Thai team to mix it up with local squads in the semifinals.